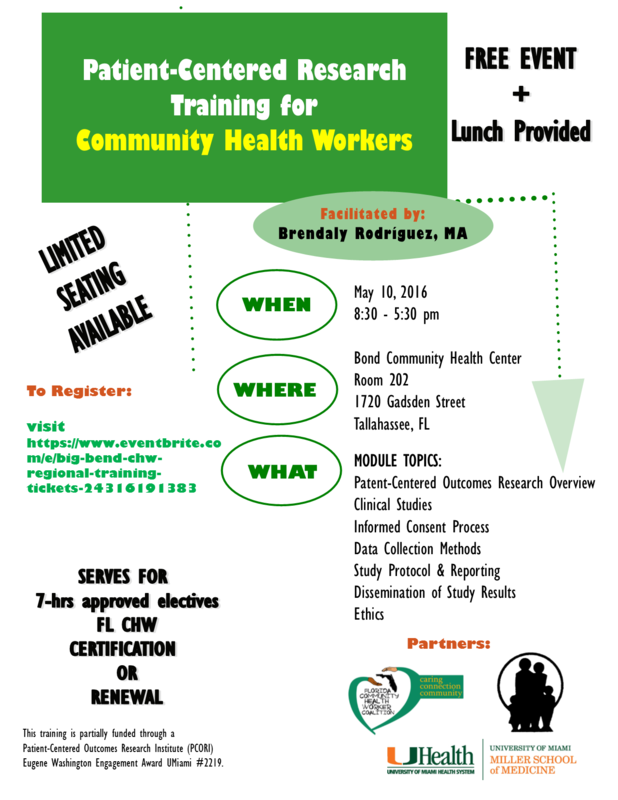 Statewide training sessions for community health workers (CHW) in patient centered outcomes research have been scheduled for April and May. and other private and federal organizations across the state of Florida. The sessions are scheduled for April 15 in Orlando, April 22 in Palm Beach County, May 10 in Northwest Florida, May 11 in North Central Florida, and May 19 in St. Petersburg, Fla. Supported by a two-year engagement award from the Patient Centered Outcome Research Institute (PCORI) to principal investigator Olveen Carrasquillo M.D., Director of the Univeristy of Miami Clinical and Translational Science Institute, these training sessions are part of a structured training program being developed in patient-centered health care research for community health workers. Over the past four years, the University of Miami, the Health Council of South Florida and the Florida Community Health Worker Coalition have led a multi-stakeholder group in developing a state certification program for community health workers that has been available to the public since January 1, 2015. To date, more than 300 community health workers have been certified. Additionally, a 7-hour patient centered outcomes research module has been developed for community health workers to use toward their state certification or renewal of their credentials. The project team will design a toolkit for PCORI that can be used by groups in other states to develop a similarly structured program. Community health workers, also known as promotores de salud, serve as a liaison between health services and the community to facilitate access to services and improve the quality of service delivery. Community health workers are also an important stakeholder group in patient-centered outcomes research. Brendaly Rodríguez, MA, is the Manager for the University of Miami CTSI Community Engagement and Cultural Diversity Program (CECD), PCORI Ambassador since 2013, and Co-President of the Florida Community Health Worker Coalition. She has lead the development of this training and will facilitate the incoming training sessions across the state. More sessions will be scheduled for later dates in 2016. If you or your organization is interested in this opportunity, please contact Brendaly: brodriguez@med.miami.edu or at 305-243-8433. Read more about the PCORI engagement award here. To learn more, visit the University of Miami CTSI CECD Program website, the Patient Centered Outcomes Research Institute (PCORI) website, and the Florida Community Health Worker Coalition website.